The message is simple; there’s a traffic control person (TCP) behind that sign, and they have a family depending on them. We’re dedicated to worker safety, and they are responsible for your safety. “All of our TCPs are trained to the standards of the Infrastructure Health and Safety Association and the Government of Ontario’s Highway Traffic Act,” says Jerome Abarquez, Traffic & Transit Manager. “The TCPs, sometimes together with paid duty officers, overrule vehicle right-of-way signs or signals when traffic must be stopped for the safety of road users.” TCPs may stop or slow traffic for construction vehicles entering or leaving the site or for crane loads that swing over the road. If you’re driving and see a TCP holding a stop sign, stop – even if you have a green light. 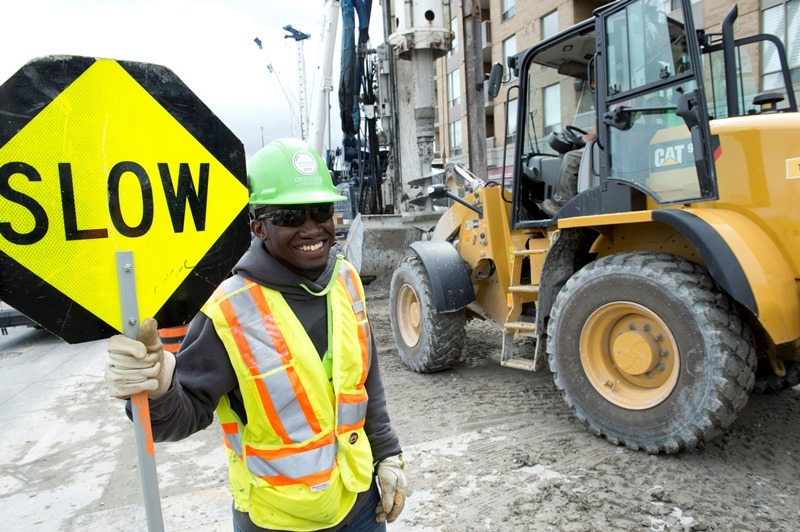 If you’re near a construction zone, slow down and watch for equipment and workers on the move. TCPs are often involved in near-miss scenarios and frequently face verbal abuse from frustrated motorists. But behind the reflective vest is a husband, wife, son, daughter, sibling or friend. TCPs are vanguards of roadway safety, for motorists, pedestrians, and other workers. Safety is our top priority as we work to build the Crosstown. Campaigns like this one help to reinforce this message and make sure everyone – workers, motorists and pedestrians – returns home each day unharmed.